We're well overdue for a school update. I don't think I've done one since the first day of school this year! As a former teacher, I endlessly geek out over the nitty-gritty of curriculum and pedegogy, so bear with me or feel free to skip this one. Daphne is in 3rd grade (Cycle 3.1) and James is in 1st grade (Cycle 2.1). They each have new-to-our-school, young male teachers this year. Both kids like their teachers, and our general impression is that they are good ones; passionate about doing their jobs well and caring toward their students. If all goes to plan, our kids will each have the same teachers next year too. James and Daphne's teachers - we took it as a good sign that they were the only two teachers to stick around and help with crafts at the school Christmas party. 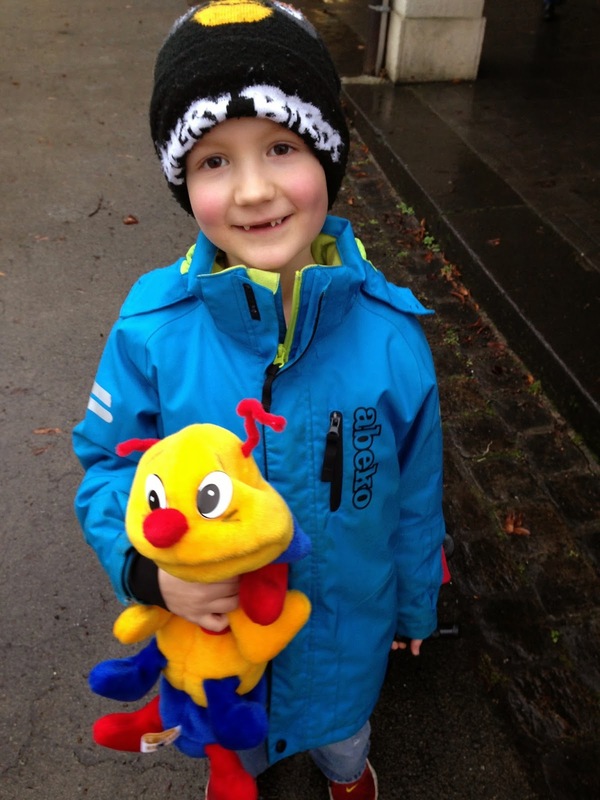 James is our second child to go through 1st grade in Luxembourgish school, so we were quite curious how his experience would compare to Daphne's. Letter from the new 1st grade teacher at the end of kindergarten. He seemed friendly. Well, as you might expect, some things are the same and some are different! 1st day of school, same classroom Daphne had the last 2 years. A couple main differences are 1) this teacher is having the students learn to write in cursive from the get-go, whereas Daphne didn't begin cursive until well into 2nd grade. Children here learn to print capital letters in kindergarten, but James is now doing a mixture, adding new cursive letters in upper and lowercase as they learn them. vowels - the "King" letters. More sneaky classroom photos. I'm assuming it's frowned upon as no other parents seem to do it! Or, they're just not big nerds who take pictures of vowels. 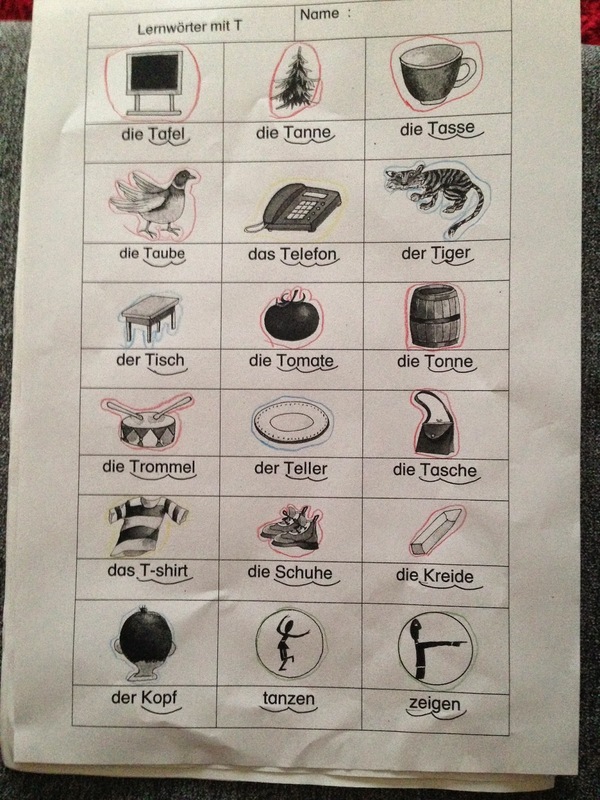 And 2) this teacher appears to be easing the kids into learning German much more slowly than Daphne's 1st/2nd grade teacher. There are fewer word lists, fewer tests, and each word list has fewer words to know than Daphne's did. has recently ramped up to a few more at a time. Overall, this teacher's philosophy feels more "modern" or "international" and less "old-school," even though Daphne's teacher was young as well. We actually really liked Daphne's teacher too, but it's interesting to see that this variety exists. James' teacher seems more concerned that his students build on a foundation of enjoying school and equating learning with fun before things get too heavy; the kind of stuff we softy-Americans can relate to. Case in point: several weeks ago I was talking to a Luxembourgish parent in the school yard and he asked me if James' teacher is good. I replied, "Well, I don't know, but he seems pretty good to me. He cares a lot about his students and is dedicated to his work. He makes learning fun. The kids seem to like him a lot." He was clearly a bit puzzled by my response. I inquired about his child's 2nd grade teacher, and he said, "Yes, she is good. She gives lots of homework and tests. The most important thing to us is that our children are well prepared for the upper grades!" Anyway, he's surely not speaking for all Luxembourgers everywhere, but our conversation illustrates a cultural difference for which we've encountered anecdotal evidence on many occasions. We'll just have to see if James will be ill-prepared for the upper grades! 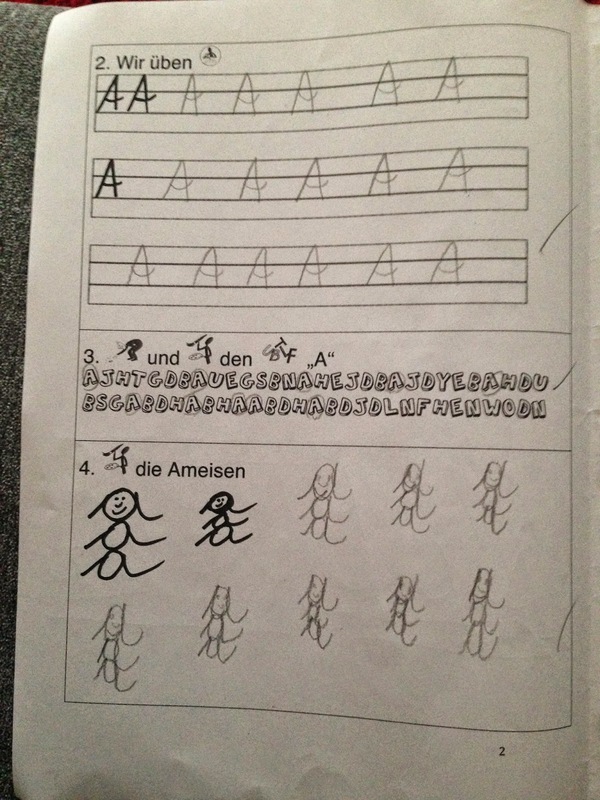 With two full years of Luxembourgish already under his belt, James is taking to German quite well so far. In fact, for the end-of-school party/talent show in which his class will be performing excerpts from The Lion King in German, guess who's been asked to play Simba? Yep! 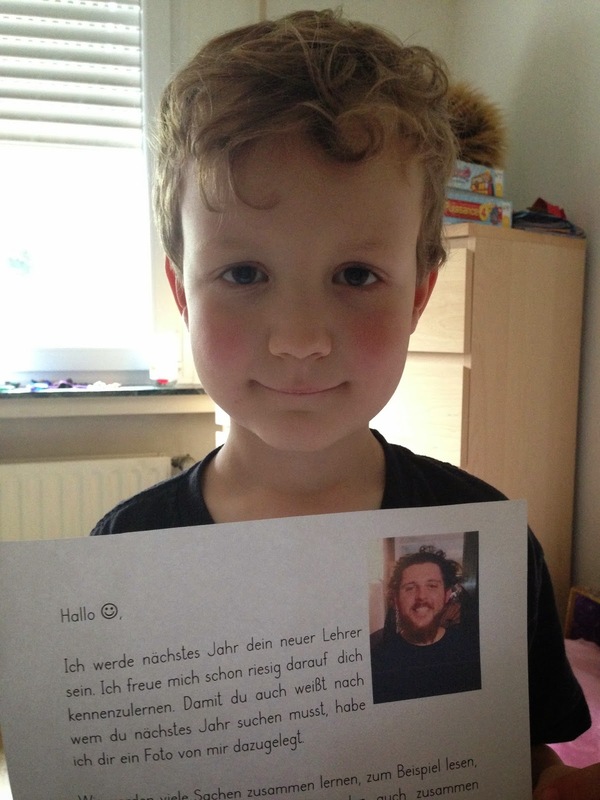 His teacher said he's adept at memorizing words and sentences in German so he thought James would be good for the lead role. You're all invited! The kids get to take Mila home on a rotating basis. She helps James study. Daphne, on the other hand, has no shortage of tests and quizzes this year, at least three per week. The main exam at the end of the week rotates between German, French and math, and takes two or more hours to complete. You can kind of see what that Luxembourgish dad was getting at! In German they've been writing longer sentences and paragraphs, and conjugating lots of verbs. They've also begun delving into some of the aspects of German that make it difficult, like articles for the same noun changing between der/die/das depending on the context. 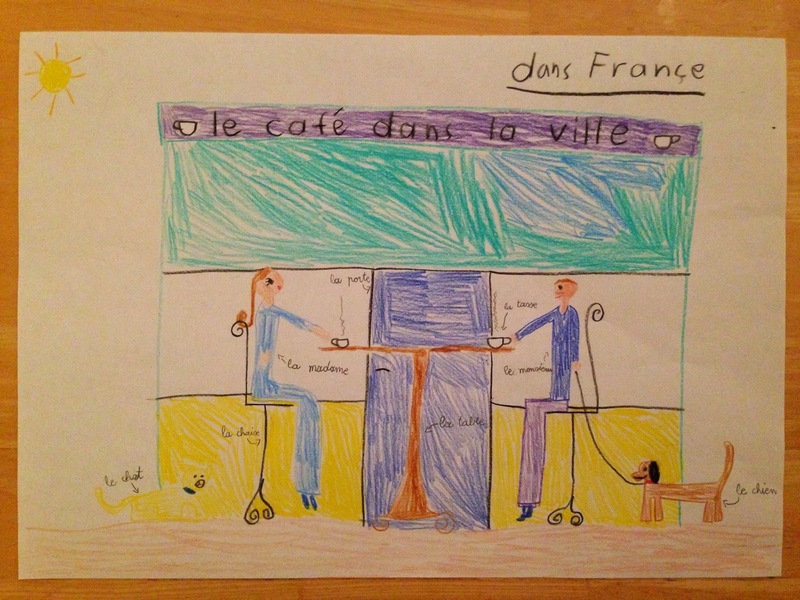 Meanwhile, the French studies that began last year have also picked up steam in 3rd grade. She continues to enjoy it so far. 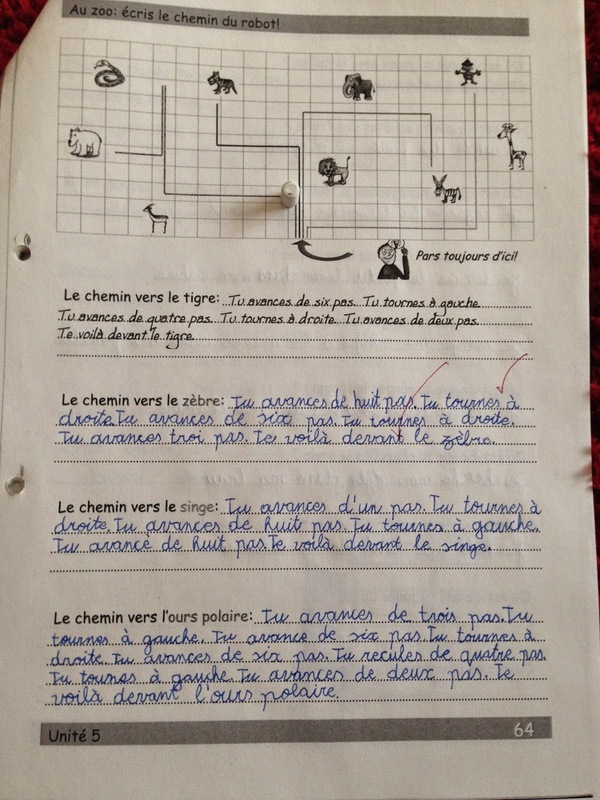 The teacher gradually speaks more French to them as the year progresses. I think right now they're alternating weeks - this week he's speaking mostly in French, so next week will be German. This constant conjugating of verbs in various languages is a bit mind-blowing, I must say. 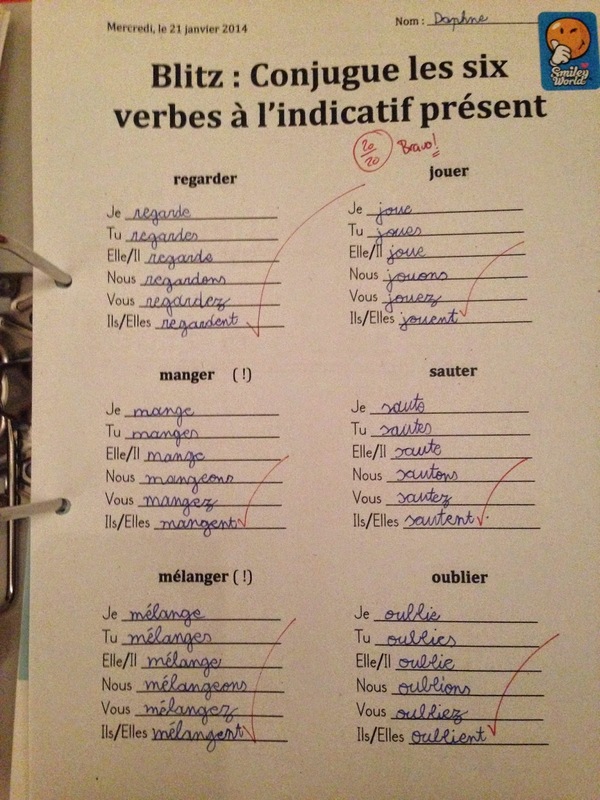 If you grew up in American schools, what grade were you in when you first had to conjugate a verb in any language (or were aware you were doing it)? I think I was in high school. And I certainly never thought about conjugating verbs in English. I often hear Daphne conjugating words to herself in English: "I am, you are, he is, she is, they are…Hey, Mom, in English, how do you know if you're talking to one person or more than one person when you conjugate the "you" verb?" File that under "Thoughts I Never Had as a 9-Year-Old." And it wasn't long before full sentences were starting to flow. Giving directions from one point to another. 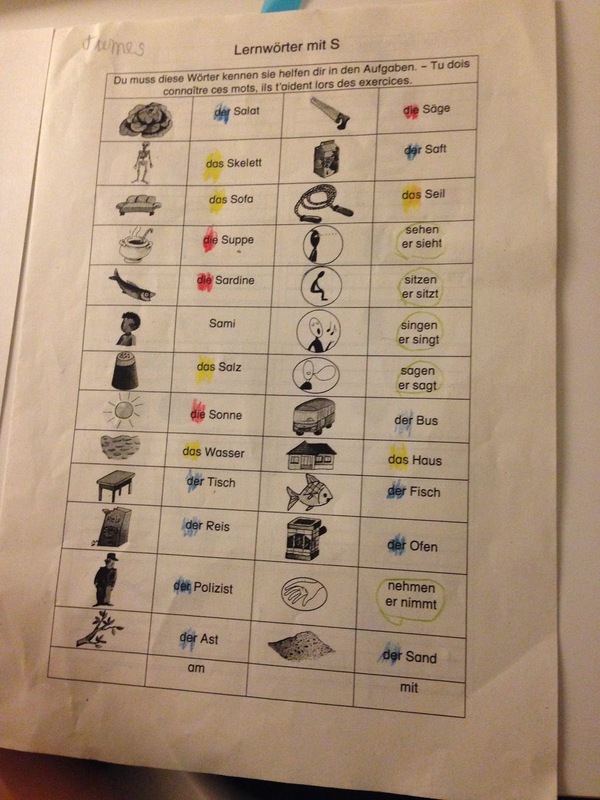 And the most mind-blowing part for her functionally-mono-lingual parents: When she does her French work, the language she's translating from, the language that makes sense to her, is German. German! German to French vocab and sentences.